Thousands of beautiful cards and gifts for every occasion – from birthday, to anniversary, to holiday. Shop top brands like Tsum Tsum, TY Toys, Yankee Candle, and more. Code: FREE5 Promotion: NEW! Buy 4 Cards and Get 5th Free [online exclusive] T&Cs: Online Only Offer! Excludes Sale Items. P&P Applies. NEW! 50% OFF Selected Disney Lines T&Cs: Includes Music Boxes, Waterdomes, Mugs, Glasses and more..
NEW! 20% OFF Willow Tree Figurines For A Limited Period Only! Valentine’s Last Orders – 2pm Tomorrow! Code: 10OFF5019 Promotion: £10 off when you spend £50 at Clintons [Online Exclusive] T&Cs: Online Only Offer. Excludes Sale Items. P&P Applies. Star Wars Tsum Tsum: Buy One Get One Free for 99p. Limited Time Only, While Stocks Last! Marvel Tsum Tsum: Buy One Get One Free for 99p. Limited Time Only, While Stocks Last! Disney Tsum Tsum: Buy One Get One Free for 99p. Limited Time Only, While Stocks Last! Get 50% OFF Wax Lyrical Advent Calendar gifts. Buy 1 Get 1 50% OFF Select Calendars & Diaries T&Cs: Excludes Discounted Items. Cannot be used in conjunction with any other offer or previous purchases. 30% Off Christmas Yankee Candle Jars & Gift Sets T&Cs: Cannot be used in conjunction with any other offer or previous purchases. Offer automatically applied at the checkout. 30% Off Christmas Home Decor. Subject to stock availability, while stocks last! 30% Off Christmas Home Fragrance. Subject to stock availability, while stocks last! NEW! Despicable Me Fluffy & Unigoat - Only Â£6.99 For A Limited Period Only! Yankee Candle Medium Jars Selected Fragrances only Â£9.99 T&Cs - Fragrances Include: A Calm & Quiet Place, Angel Wings, Autumn Glow, Spiced White Cocoa. 30% Off Baylis & Harding, For A Limited Time Only, While Stocks Last! NEW! 2 Zodiac Pot of Dreams & Mugs for Â£15.00. Limited Period Only, While Stocks Last! Better Than 50% Off Selected Disney 10â Classic Soft Toys Hurry for A Limited Period Only! 3 for 2 on Funny Cards (Cheapest Item Free) For A Limited period only, subject to stock availability! 30% Off Selected Yankee Candle Large Jars Hurry for A Limited Period Only! Subject to Stock Availability. While Stocks Last. 20% Off Disney Waterdomes Was Â£25 NOW Â£20 Expires Ã¢ Limited Period Only, Subject to Stock Availability, While Stocks Last! 20% Off Marvel Gifts For A Limited Period Only, Subject to Stock Availability, While Stocks Last! 20% Off Selected Disney Gifts For A Limited Period Only, Subject to Stock Availability, While Stocks Last! 20% Off Selected Disney Princess Gifts For A Limited Period Only, Subject to Stock Availability, While Stocks Last! 20% Off Selected Disney Winnie the Pooh Gifts For A Limited Period Only, Subject to Stock Availability, While Stocks Last! 20% Off Selected Star Wars Gifts For A Limited Period Only, Subject to Stock Availability, While Stocks Last! Kids Cards - 4 for 3 Offer for Limited Time Only! 50% off on selected “Cosmopolitan” stationary at Clintons from £1.50 – the Secret Santa and stocking fillers! These Clintons coupon codes have expired but may still work. Code: 20CARDSYES Promotion: 20% off all cards at Clintons [online exclusive] T&Cs: Online Only Offer! Excludes Sale Items. P&P Applies. Code: 20CARDSYES Promotion: 20% off all cards at Clintons [online exclusive] T&Cs: Online Only Offer. Excludes Sale Items. P&P Applies. Code: 5FREE19 Promotion: Buy 4 Cards and Get 5th Free [online exclusive] T&Cs: Online Only Offer. Excludes Sale Items. P&P Applies. Code: 10FORMUM Promotion: 10% off Mother's Day Shop [online exclusive] T&Cs: Online Only Offer. Excludes Sale Items. P&P Applies. Code: SPECIALBUY Promotion: 3 for 2 across the store [online exclusive] T&Cs: Online Only Offer. Excludes Sale Items. Cheapest Item Free. P&P Applies. Code: 20CARDSFEB Promotion: 20% off all cards at Clintons [online exclusive] T&Cs: Online Only Offer. Excludes Sale Items. P&P Applies. Get 10% OFF Valentine's Day Gifts, Cards & Wrap T&Cs: P&P Applies. Code: 5FREE19 Promotion: Buy 4 Cards and Get 5th Free [online exclusive] | T&Cs: Excludes sale items. P&P applies. 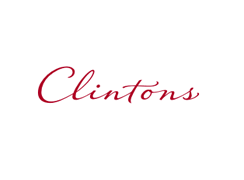 Code: 20OFFCARDS Promotion: 20% off all cards at Clintons [online exclusive] T&Cs: Excludes sale items. P&P applies. Code: 25GFTDEC Promotion: 25% OFF Christmas Gifts Weekend Flash Event T&Cs: Online Only! Cannot be used in conjunction with any other offer, previous purchases or items already reduced in price. Code: PROMO50DEC Promotion: 10 pounds off when you spend 50 pounds [Online Exclusive] T&Cs: Online Only! Black Friday Weekend Event: 10% OFF When You Spend £15, 20% OFF When You Spend £30, 25% OFF When You Spend £40 T&Cs: Only Only, Subject to stock availability, While Stocks Last! 3 For 2 Online Site-Wide Exclusive. Subject to stock availability, while stocks last.